South-West Pacific Area - First Year: Kokoda to Wau. MONASH, J. (By A.J. Smithers). Two Men I Knew: William Bridges and Brudenell White Founders of the A.I.F. Breaker Morant - A Horseman Who Made History. With a selection of his Bush Ballads. MORANT H. (By F.M. Cutlack). Anzac to Amiens. A shorter history of the Australian Fighting Services in the First World War. Our Days. On the Gold Coast In Ashanti In the Northern Territories and the British Sphere of Occupation in Togoland. ...In Aid of the Red Cross 1918. Australia in the Korean War 1950-53. 2 vols. (Vol. I: Strategy and Diplomacy; Vol. II: Combat Operations). Reluctant Nation. Australia and the Allied Defeat of Japan 1942-1945. Sir Thomas Livingston Mitchell and his World 1792-1855. Surveyor-General of New South Wales 1828-1855. MITCHELL T.L. (By W.C. Foster). Capital Campaigners. The History of the 3rd Battalion (Queen Mary's Own) The Baluch Regiment. 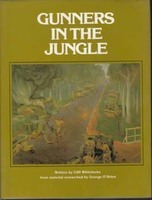 Gunners in the Jungle: A Story of the 2/15 Field Regiment Royal Australian Artillery 8 Division Australian Imperial Force. WHITELOCKE C. and G. O'BRIEN.